When Dylan Sikura takes to the ice in Traverse City, Michigan this weekend for the Chicago Blackhawks annual prospects tournament, the speedy forward will be putting his skills to the test against some of the Hawks’ elite first and second round draft choices. For the Aurora native, his path to the big leagues has been more of a journey since being drafted in the sixth round four years ago: but one he says he is now ready for. 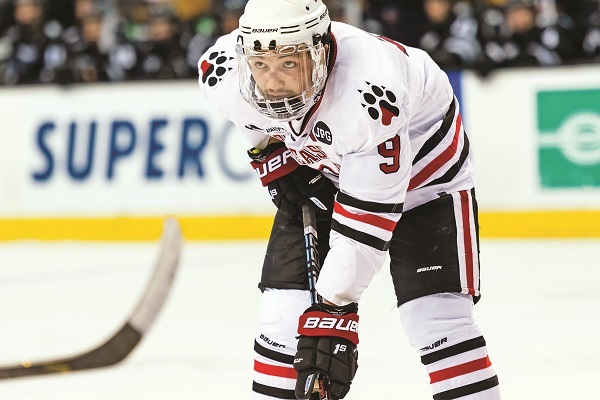 The 22-year old Sikura spent most of three seasons with the OJHL’s Aurora Tigers, before becoming a prominent piece up the middle for the NCAA’s Northeastern University Huskies over the past four seasons. Over four seasons at Northeastern, Sikura averaged more than a point per game, with 58 goals, 88 assists and 146 points in 137 games. Sikura’s college career ended with an upset when the Michigan Wolverines beat Northeastern 3-2 in the first round of the 2017-18 NCAA tournament. He signed an entry-level contract worth $925,000 with the Blackhawks shortly after. Described by Hawks brass as having a “meteoric rise” up the Blackhawks prospect charts in recent years, Sikura jumped from twenty-second to fifth on the Hawks “Top 25 Under 25” list released by the team last month. His five games spent in the NHL late last season, where he showed chemistry with some other big-name young wingers like Alex DeBrincat and Brandon Saad in putting up three assists in five games, helped his cause significantly. Sikura will also have another familiar name at training camp this season: older brother Tyler Sikura, the 26-year old centreman who signed with the Blackhawks last year, and a current member of the Blackhawks’ AHL affiliate, the Rockford IceHogs. The brothers last skated together as members of the St. Andrew’s College Saints in Aurora.